Pam is not alone. More than 44 million individuals currently provide care to one or more family members. Although there have always been family caregivers, today’s caregivers face more challenges than ever before. Due to medical advancements and treatments, people are living longer. According to a MetLife Juggling Act Study, Balancing Caregiving with Work and the Costs of Caregiving, the majority of caregivers underestimate the time they will spend as caregivers, believing it will be two years or less. Unfortunately, the average length of time spent caregiving is closer to eight years. Obviously this presents a “good news/bad news” situation. Children want their parents to live as long as possible, but being a caregiver can be extremely taxing. For most, the worst part is seeing their parent’s health deteriorate. Pam, mentioned in the outset, hates to watch her mother suffer from dementia. “It’s extremely difficult because, in addition to being a caregiver, I’m grieving for the mother and friend I had.” Sadly, this sentiment is fairly common among family caregivers. Suzanne Geffen Mintz, president and co-founder of the National Family Caregivers Association (NFCA), reports, “One of the biggest problems family caregivers experience is depression. They have a much higher rate of depression.” According to the NFCA, 61 percent of family caregivers suffer from depression. Unfortunately, the list of problems goes on. Experts agree that taking time for oneself is an essential key to maintaining good health, but for family caregivers, spare time is a rare commodity. Enter ClearCare. 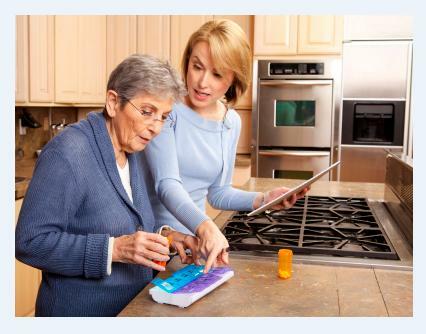 The ground-breaking technology offered by ClearCare is an answer to the caregiver’s prayer. Working with a reputable agency that provides time-saving homecare solutions gives you the time you so desperately need. You are still completely involved in your loved one’s care but now there is a balance of care. Instead of living exclusively for your elderly parent, ClearCare allows you the freedom to live your life. Imagine sipping coffee on your front porch in the mornings, or curling up on the couch on a rainy afternoon. Spending more time with your spouse and children – time you can’t get back once it’s gone, yet, you can still check in on the care of your loved on by simply logging in to a computer. Think about the possibilities and let ClearCare give you the most precious of gifts – time.